PARIS – Six years after taking over perennial underachiever Paris Saint-Germain, the French club’s wealthy owners finally got what they wanted by hiring Neymar – a player they believe will bring them Champions League glory. The Brazil star became the most expensive player in soccer history after completing his blockbuster transfer from Barcelona for 222 million euros ($262 million) on Thursday. By paying the release clause in his contract, PSG shattered the world transfer record to sign arguably one of the top three best attacking players in the game, alongside Lionel Messi and Cristiano Ronaldo. The previous transfer record had been set a year ago when Manchester United paid 105 million euros (then $116 million) to bring Paul Pogba back from Juventus. Ironically, the 25-year-old Neymar signed a five-year contract with the French league side just five months after playing a decisive role as Barcelona produced a comeback that made Champions League history – at PSG’s expense. Having lost their first leg match 4-0 in France, Barcelona was trailing 5-3 on aggregate in the 88th minute in Spain, only for Neymar to score twice in the final minutes before Sergi Roberto’s winner in added time sealed a humiliating exit from the Round of 16 for PSG. Next season, it will be different. PSG would certainly welcome the kind of success that Neymar enjoyed in Spain. In his four seasons there, Neymar scored 105 goals as Barcelona won the Champions League, Club World Cup, two Spanish league titles and Copa del Rey three times. Now he will look to emerge from the shadow of five-time world player of the year Messi at Barcelona, becoming the biggest star in the French league in a team without the track record of success to match his former club. While Barcelona has lifted the European Cup five times and won the FIFA Club World Cup three times, PSG is yet to win either prestigious competition. Since Qatar Sports Investments took over the club in June 2011, PSG has spent several hundred million dollars on top-class players – including the likes of Zlatan Ibrahimovic, Marco Verratti and Edinson Cavani – in its effort to build a team capable of winning Europe’s top club competition. But the big names were not enough to bring success on the continental stage, and PSG has yet to make it through the quarterfinals of the Champions League under its Qatari owners. It’s a mission that is clearly shared by the club’s top management. 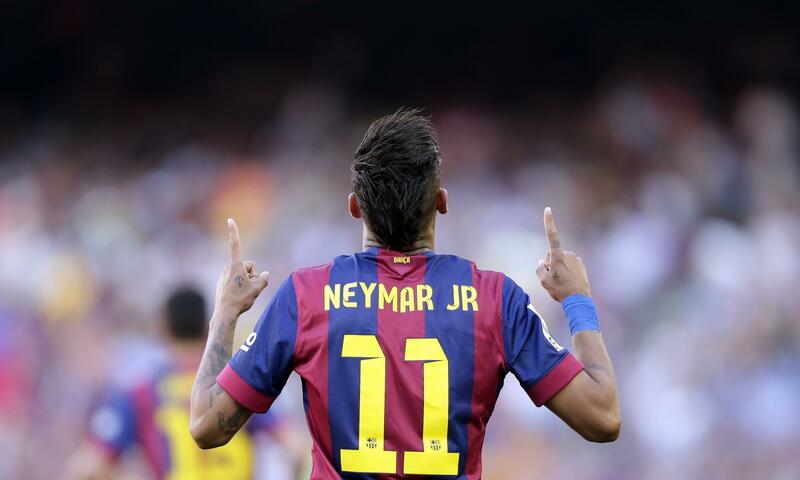 “Neymar Jr is today one of the very best players in world football. His winning mentality, strength of character and sense of leadership have made him into a great player,” PSG president Nasser Al-Khelaifi said. “He will bring a very positive energy to this club. PSG’s announcement put an end to a saga that started about two weeks ago with rumors of his possible transfer, though the club had already tried to lure him to the City of Light last summer. Neymar is expected in Paris on Friday and will hold a news conference early in the afternoon, PSG said. He might make his debut on Saturday when PSG starts its new league campaign against promoted Amiens at the Parc des Princes. Not surprisingly, his transfer has not gone down well in Spain. The comment followed a claim by Spanish league president Javier Tebas on Wednesday that Neymar’s move would break Financial Fair Play rules introduced by UEFA, European soccer’s ruling body. Barcelona did all it could to stop Neymar from leaving, and had vowed to complain to UEFA if his seemingly untouchable release clause was triggered. The payment of the release clause was the second attempt Neymar’s representatives had made on Thursday to break his bond with Barcelona. Earlier in the day, his lawyer Juan de Dios Crespo had tried to deposit the enormous sum at the Spanish league’s offices in Madrid, but he was turned away. Tebas had told Spanish sports daily AS that he wouldn’t let the league act as an intermediary to an operation that he, like Barcelona, believed violated UEFA’s FFP rules. He had called PSG a “state-supported club.” The club’s Qatari owners are closely linked to the energy-rich ruling family. Published: Aug. 3, 2017, 10:12 a.m. Updated: Aug. 3, 2017, 2:53 p.m.